The Courts of Common Pleas are the trial courts of Pennsylvania. Major civil and criminal cases are heard in these courts. Judges also decide cases involving adoption, divorce, child custody, abuse, juvenile delinquency, estates, guardianships, charitable organizations and many other matters. Judges of the Common Pleas courts are elected to 10-year terms. A president judge and a court administrator serve in each judicial district. Franklin County will begin consturction around the Franklin County Courthouse. Durning this construction, there will be very limited parking. We have provided a map in the link below. On this map you'll find the following information on where to park, costs and walking distances. The parking meter rate is 25 cents per hour. Meters only accept quarters. Silver meters have a 2 hour limit and green meters have a 12 hour limit. All meters are in effect Monday through Friday from 8 a.m. to 5 p.m. and are free on evenings and weekends. 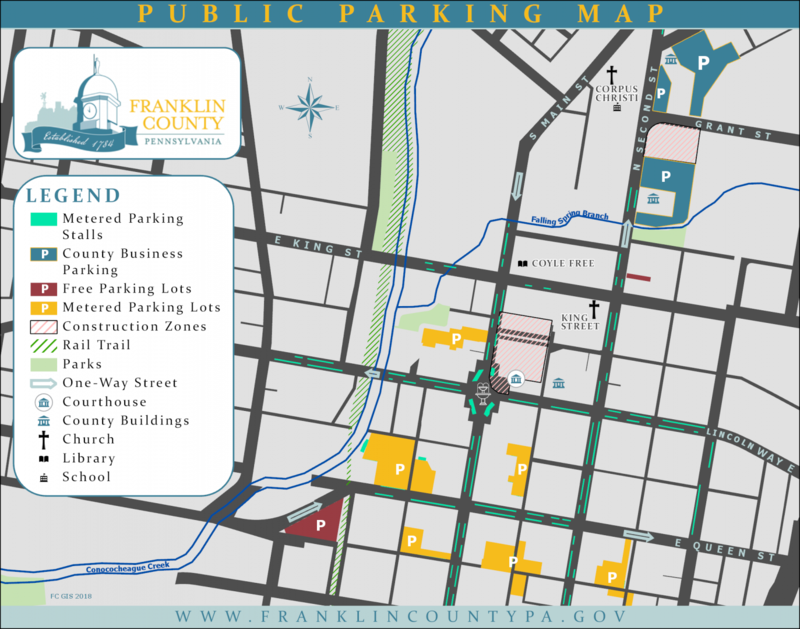 Parking lots located furthest away from the Franklin County Courthouse, as shown on the Public Parking Map, are an estimated 8-10 minute walk. Find answers to frequently asked questions about Jury Duty.